LOUISVILLE, Ky. — Baseball legend Johnny Bench was the keynote speaker at the International BoatBuilders’ Exhibition & Conference breakfast Sept 15th where Bench spoke on the “Vowels of Success” offering an inspirational framework for industry members and touched the bases of action that he encourages people to follow on the path to success. action that he encourages people to follow on the path to success. Source: Trade Only Today. Bench’s “vowels” include Attitude; Effort for Excellence; No I in Team; and Using Knowledge. “Aspire to inspire before you expire,” he said. Johnny Bench is a former catcher who played in the Major Leagues for the Cincinnati Reds from 1967 to 1983 and is a member of the National Baseball Hall of Fame. Bench, a 14-time All-Star selection and a two-time National League Most Valuable Player, was a key member of The Big Red Machine, which won six division titles, four National League pennants, and two World Series championships. ESPN has called him the greatest catcher in baseball history. He is a popular inspirational speaker and has used his celebrity to benefit the Heart Association, the American Cancer Society (as past National Chairman of Athletes vs. Cancer), the Kidney Foundation, the Franciscan Sisters of Poor Health System, the American Lung Association and the “Catch the Cure” program of Children’s Hospital of Cincinnati. Sports Speakers 360 is a booking agent for pro athletes. 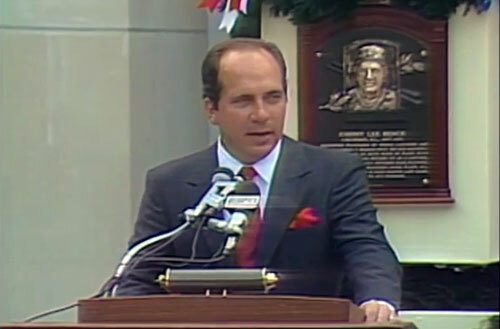 If you would like to book Johnny Bench for a speaking engagement, appearance or endorsement, contact Johnny Bench’s booking agent for fees at 1.855.303.5450.